Proposals for one of the country’s most ambitious cycling and walking routes have today been unveiled as part of Greater Manchester’s plans to deliver the UK’s largest network. The Manchester to Chorlton cycling and walking route is being proposed by Manchester City Council, the One Trafford Partnership, Transport for Greater Manchester and Greater Manchester’s Cycling and Walking Commissioner, Chris Boardman. Local residents, businesses, community groups and other interested parties are now invited to review the proposals and have their say at www.manchester.gov.uk/consultations. Running along Barlow Moor Road, Manchester Road, Upper Chorlton Road and Chorlton Road, the new five kilometre route will benefit local residents and anyone wishing to cycle between the city centre and the thriving Chorlton area. The new route has been designed using best-practice examples from the UK and other European cities with an established cycling culture. It has been designed in partnership by TfGM's walking and cycling team and Manchester City Council engineers, who this year won the National Transport Award for Excellence in Cycling and Walking for their work on the Wilmslow Road / Oxford Road corridor. 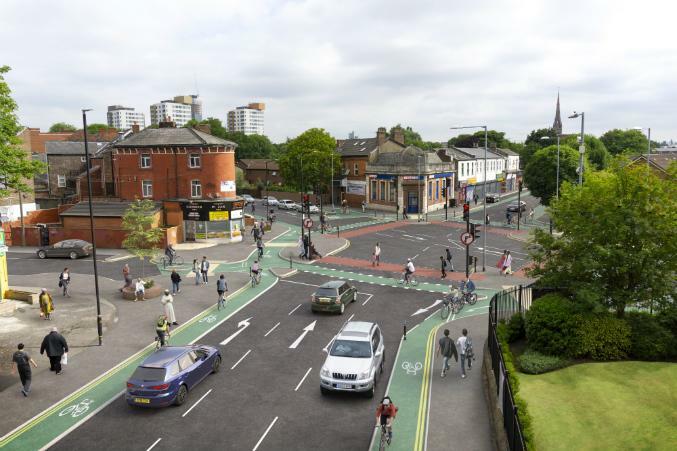 The Chorlton route will feature Dutch-style segregated cycling and walking lanes and some of the most advanced junctions in the UK. £13.4 million is being invested in the new route, with funding coming from the Greater Manchester Mayor’s Challenge Fund and the government’s Cycle Cities Ambition Grant. Manchester City Council's Executive Member for the Environment, Planning and Transport, Councillor Angeliki Stogia, said: “We are excited to have Chris Boardman's input on creating world-class walking and cycling infrastructure in Manchester. Lots of people have said that they want to walk and cycle more in Manchester and we present this scheme for consultation, as part of our ambition and absolute determination to create a new network of high-quality, safe cycling routes across the city. We would like as many people as possible to have their say on the plans. “This is already a very busy corridor for cyclists, but the proposed upgrade will make the route much safer and more appealing, encouraging many more people to adopt cycling and walking as their preferred modes of transport. Greater Manchester’s Cycling and Walking Commissioner, Chris Boardman, added: “We want to make cycling and walking the natural choice for short journeys, giving people the freedom not to have to drive. That means creating world-class streets where people want to socialise and relax. Some of the junction designs proposed are the most advanced yet that we’ve seen in the UK. Detailed designs for the Metrolink bridge road option on Manchester Road and the junction at Stretford Road / Chorlton Road are still being worked up to ensure that they meet the same high standards for people travelling on foot and by bike. Plans for these aspects will be published in the New Year. The public consultation period on the designs will run until 11 January 2019. Four public events will take place in Chorlton and Stretford during November and December. To find out more, go to www.manchester.gov.uk/consultations.